Amazon finally announced the Kindle DX (for Deluxe) extra-large e-reader this morning. The 18.9-ounce device has a 9.7-inch screen that measures 8.5 x 11 inches — 2.5 times the size of Kindle 2's display. The Kindle DX is described as having a 1200x824 pixel resolution at 150 ppi, and 16 levels of gray. At one-third of an inch in thickness, it's about the same thickness as a magazine, or a multiply-folded newspaper section. The new device will autorotate the image from portrait to landscape. It has native support for PDF files. Kindle DX can also read print for you like the Kindle 2. Amazon is pursuing relationship with textbook makers as well as newspapers to provide content for the device. Once you've purchased a newspaper or magazine subscription, Amazon will push the content onto your device overnight automatically. 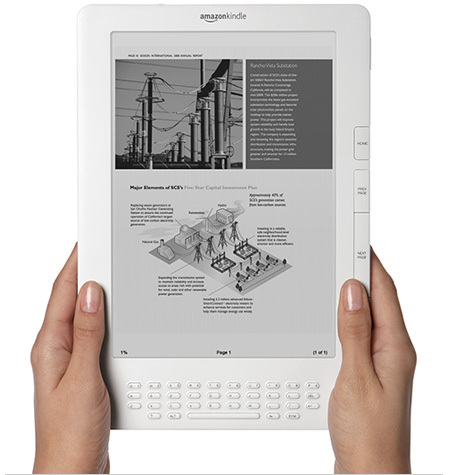 Like the Kindle 2, the Kindle Dx does not require a PC for downloads; it has its own 3G connectivity. Read for four days on a charge with wireless on, up to two weeks with wireless off. Although this is not quite the e-paper newspaper envisioned in movies like Stephen Spielberg's 2002 movie Minority Report, it's starting to get close. Kindle DX offers RSS feeds as well, so you can get exactly the online news that you want, along with standard newspapers. SF readers may be trying to get Hugo Gernsback's 1911 classic Ralph 124c 41 +, so they can read about his prediction of personalized news that is pushed to subscribers each night. The morning "newspapers" were transmitted to the sleeping subscribers by wire at about 5 a.m. The newspaper office, notified by each subscriber what kind of news is desirable, furnished only such news. The Kindle DX will be shipping this summer; the price - $489. From Amazon.com; use the link to see a nice video describing the device.